The title Cat Peoplecould be misleading. Half-cat, half-human creatures roaming the streets (akin to An American Werewolf in London) is the first thought that comes to mind when the title – and its sequel The Curse of the Cat People – appeared in the BFI Gothic Season guide. Instead, this 1943 staple of the Universal horror film catalogue is a moody, sinister approach to psychiatry. Indeed, the question lingering in the fog, as to whether the woman is a cat at all is only answered in the third act of the film. Highlighted in the BFI notes, producer Val Lewton “tossed away the horror formula right away from the beginning”, he adds “no grisly stuff for us”. Indeed, this is Cat People’s strength. We are forced to consider who Irena really is and stand-out scenes linger in your mind through Simone Simon’s edgy, convincing performance. In one scene she follows Alice home while director Jacques Tourneur cuts between the two sets of feet running down the street. Another sequence remains eerie as Alice leaps into a swimming pool as reflections flicker around the pool as we hear cat sounds. 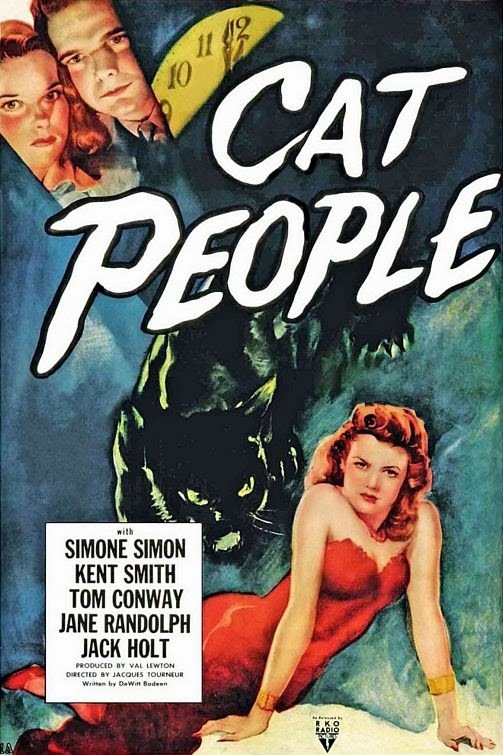 Val Lewton/RKO-produced horror films of the 1940’s were hugely influential, and Cat People has a charm that resonates. In 1942, it became RKO’s highest grosser for the year bringing in $4m. Because it was cheap and successful – like a contemporary Hollywood horror film such as Paranormal Activity – it was copied across Hollywood in the following years. But, the subtlety and growing intensity was harder to imitate. Getting under your skin, Cat People toys with a fear of loneliness and detachment, as if we are witnessing a husband who fails to understand his wife’s challenges – and pushes her away in the process. This is Part I of a double-bill with The Curse of the Cat People, Part II of the review can be read here. The full review is on Flickering Myth.